We have emerged as a dependable Manufacturer, Supplier and Exporter of Ultrasonic Stencil Cleaner in Mumbai India the global market. The Ultrasonic Stencil Cleaner, offered by us, is available in various grades and specifications as per the customer requirement. Ultrasonic Stencil Cleaner uses hi-tech Ultrasonic technology during the cleaning action. 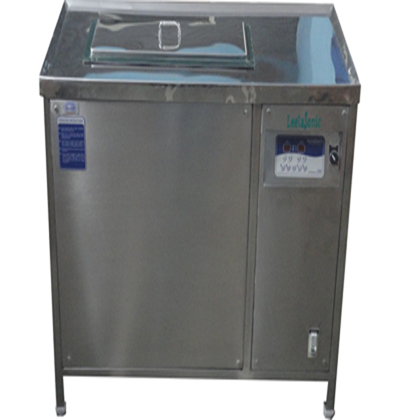 The Ultrasonic Stencil Cleaner is used in Electronic and other industries. Leela Electronics designs and manufactures a highly efficient, easy to use and environmental friendly stencil cleaner developed exclusively for use with cleaning PCB stencils and related components. 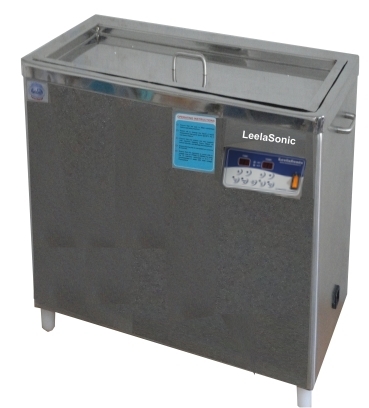 Leela Electronics uses a module ultrasonic cleaning system to achieve the required cleaning without using conventional stencil cleaning methods. The ultrasonic stencil washing process permits penetration of minute crevices to remove solder paste, flux or SMD adhesives more efficiently than spray washing or hand-wiping and without the use of harmful solvents or aggressive chemicals. Tough enough for dried-on paste, gentle enough for fine pitch screens, stencils, and misprints. Choose from two standard models to take any size of stencil. Options include custom-designed machine to fit any size PCB stencils, parts-holding racks. Temperature control heat in tank. Custom designed machine to accommodate any size stencil. Custom designed stencil racks or parts baskets to match parts cleaning. Analogue or digital temperature control. Two Stage ( Ultrasonic Cleaning & Rinsing ) Stencil Cleaner are also available. 35" X 4" X 37"
35" X 6" X 37"